Go further for less effort and see why the world's going crazy for E-bikes on this leisurely day tour through the fantastically picturesque region of Hawke's Bay. Spend a fun-filled and relaxing day exploring the delights of Hawke's Bay from the comfy saddle of an E-bike, letting the bike do the work whenever you feel the desire. Pedal through stunning scenery stopping at wineries and tourist attractions along the way. Bask in the beautiful natural landscapes and enjoy watching flocks of black swans and native birds at the wetlands. Cycle along the coast, visiting local communities before heading back towards Napier and discovering the Art-Deco delights that await you there. Meander along river and estuary trails taking in superb orchard and vineyard country views at every turn. End the tour in picturesque Ahuriri, drawing to a close a fulfilling adventure. Seven glorious days in Hawke's Bay surrounded by blissful coastal views, rural cycle trails, abundant wildlife, fine wines and plenty of activities to keep everyone occupied, find your happy place on the beautiful east coast. Starting and ending in the picturesque historic port of Ahuriri, the tour takes you on an enjoyable week-long expedition through the nooks and crannies of fantastic Hawke's Bay. Follow coastal trails and ancient rivers through flatlands and wetlands surrounded by wildlife and breathtaking views. Stop for refreshments at the quaint villages and rural communities dotted along the route and savour the local produce on offer at the many wineries you'll discover along the way. Cycle popular country routes and classic road rides, enjoy valley views, estuary trails and leisurely biking. Choose from a multitude of activities on offer or simply relax in the natural ambience of the region. A great way to spend seven days, whatever your fancy. Explore brilliant, beautiful and bountiful north-east Victoria. The four-day Tour de Bright is a fully-supported, self-guided, all-inclusive cycling tour from Beechworth to Bright, taking all the stress out of your adventure, but giving you all the freedom you crave. You can cycle at your own pace, stop for as long as you want at the designated stops, and explore places off the beaten path if your heart desires. Having said that, the tour operator has ensured if you follow nothing else but your provided itinerary you will be savouring the best of the region so you will not be missing out. This 5-day self-guided cycling tour of North East Victoria is for anyone wanting to cover all the major sights and gourmet delights in this increasingly popular cycling region. Using the paved, largely flat, off-road Murray to Mountains rail trail as the cycling path, you will taste the gourmet treats that abound in the northeast Victoria region, as well as enjoying the incredible scenery and accessible and safe cycling paths. Starting in Beechworth, you will cycle to Milawa, Myrtleford and Bright over 4 nights. The Tour de Murray to Mountains Rail Trail is a gloriously fun three-day self-guided cycling tour. A combination of easy, safe and supported cycling on the Murray to Mountains Rail Trail, including accommodation for 2 nights, food & wine tastings, tutorials and local experiences in the increasingly popular gourmet hub of north-east Victoria. A gorgeous itinerary combining scenic cycling at a leisurely pace, amazing food and luxurious accommodation through the heart of Hawke's Bay. Treat yourself to a delightful exploration of the best of Hawke's Bay on a 6-day gentle adventure, discovering blissful scenery, opulent accommodation, fine foods and magnificent wine country. Leisurely bike along verdant lanes spanning coastal paths, river trails, estuary bikeways and vineyard tracks. Soak up the superb scenery and revel in the abundant local produce, sampling world-class wines and extraordinary gourmet food along the way. Stay in exquisite lodgings, bathing in supreme luxury with breathtaking views, leaving you thoroughly refreshed, relaxed and enchanted by this lovely region. Meander through picturesque Hawke’s Bay on a three day gentle riding tour through off-road trails, surrounded by stunning views, vineyards galore and plenty to enjoyably fill your days. Take a mellow ride through NZ’s tranquilly beautiful Hawke’s Bay and immerse yourself in an environment rich in wildlife, heritage and delightful views. This short three-day pedal will see you venturing off-road on mostly level trails with ample space and lovely surrounds. You’ll discover a lush region famous for its extensive vineyards, a number of which you are welcome to discover via the detailed itinerary. Fine wines aside, your serene journey through Hawke’s Bay will also reward you with beautifully natural vistas, easy-going and relaxing cycling, vibrant country towns, fun tourist attractions, coastal pathways and the fascinating Art-Deco city of Napier. An incredibly varied journey of discovery through the beautiful Hawke's Bay region with challenging cycling, superb views, outstanding wine and tranquility guaranteed. Delve into the Hawke’s Bay region on a fantastically diverse tour, as the name might suggest, taking you on a marvellous 5-day adventure through a variety of landscapes. There is so much to see in this wonderful area, and yet it feels as if the tour operator has managed to condense most of it into a relaxed but highly organized short exploration of the finer points. Although the ambience and the landscape do promote a sense of calm, the cycling itself is on the challenging side with relatively long distances to cover and several inclines to master. Therefore a good level of fitness will ensure that you enjoy this trip to its fullest. So saddle up and hit the peaceful country roads for an east coast expedition of excellence. Join a guided small group on this exclusive cycling tour of Hawke's Bay. Centred around Napier, this 5 day all-inclusive cycling tour is the perfect way to experience everything the wonderful Hawke's Bay region of New Zealand has to offer, and more! Experience the best of this compelling gourmet region of New Zealand on this guided cycling tour of Hawke's Bay. Similar in climate and wines, Hawke's Bay has been likened to the Mediterranean of the Pacific, and rightly so! Long, sunny summers and mild winters make this a year round destination ideal for cycling. This is a premium, fully-guided tour, and you are looked after from start to finish. Quality accommodation, gourmet meals, all winery visits, transport and a guide are all included. Sit back, cycle a little and enjoy all the best of this beautiful and surprising wine region of New Zealand. This unique tour explores the famous Barossa, Clare Valley and equally impressive McLaren Vale wine regions via the seat of a bike. Fun, off-road cycling, beautiful scenery, iconic wine and sumptuous food all combine on this ultimate gourmet exploration. 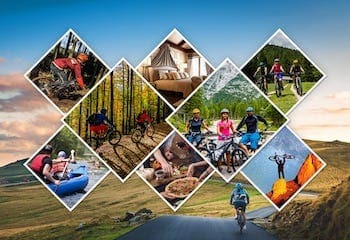 Biking on easy, safe and well laid off-road paths, you'll discover the incredible food and wine of South Australia on this fantastic cycling tour. Enjoy visiting world-class cellar doors for wine tastings; experience the Riesling Trail in the Clare Valley, and the Coast to Vines Rail Trail in McLaren Vale; savour the best of this gourmet region of Australia. We’ll find your perfect tour available on the market, tailor it, or create it. Use our complimentary concierge service!